See-through design for added security and constructed from heavy gauge powder-coated, fire safe steel. 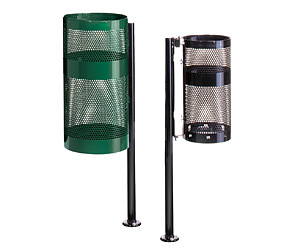 These pole or wall mounted basket waste receptacles are also vandal resistant. Featuring bottom drain holes to prevent the accumulation of water and folding retainer bands hold poly bags securely in place. Available with surface mount, in-ground mount, and wall mount. Provide a clean modern look with the optional funnel top or lid kit. Ships fully assembled.